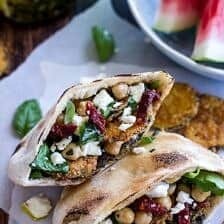 [social_warfare]I made us the best pita sandwiches for lunch today! Because one, we are coming up on zucchini season. Two, it is picnic and grilling season. And three, I am nervous and apparently that makes me want awesome Greek food. Ok, well that last one is not so true. Yes, I am nervous, but when I am nervous I really just can’t sit still and I fidget… ALOT. Traveling makes me so nervous, I hate flying and the whole airport thing. It’s just never very fun, at least for me… and especially when your flight leaves at 1:10am. Not sure what I was thinking when I thought the whole 1:10am thing was a good idea. I guess I still think it is a good idea because instead of wasting a whole day traveling I am wasting a whole night. It works, but you know I am anxious. Truth is I would be anxious no matter what, that’s just the way I am. Anyway, these sandwiches I made us today? I think they would be kind of perfect to pack up for lunch. Maybe not to take on an airplane because they might get a little messy, but a summer picnic for sure! Honestly, I kind of loaded these up with some seriously good stuff. First up, the greek olive pesto. I promise this is so good. Even my mom who is not an olive fan, really loved this pesto. It’s salty, cheesy and just a little sweet from the olives. It’s also a good way to change things up a little instead of using basil pesto. Second, FRIED ZUCCHINI!! Nothing more to say here other than that we should all be making these everyday this summer. Third, marinated feta. 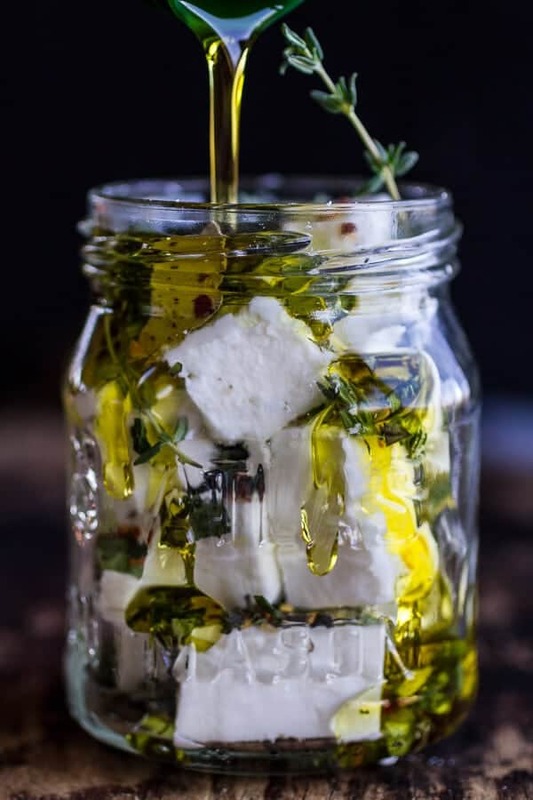 I know that feta on it’s own is totally awesome, but marinated in olive oil and summer herbs takes it to a whole new level. Trust me. Fourth, the slightly crunchy chickpeas (or garbanzo beans). They add a little texture and crunch to the mix. Plus a little protein, you know, to hold us over till umm…we need some chocolate or something. Fifth, a little sun-dried tomatoes and arugula. These are for added color and really, I just love sun-dried tomatoes. Sixth? Pita bread!! Mmmm, that and naan, so good. Next, put the whole thing on the grill to get it all toasted and warm. Delish. Of course if you don’t have access to a grill or oven, this step can be skipped, but we love everything a little warm over here. Oh and bonus points if served up with some watermelon on the side. I feel like every summer dish is not complete without a little watermelon, you know? 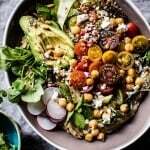 Add the cubed feta, thyme sprigs, basil, bay leaf, black peppercorns and crushed red pepper to an 8 ounce or larger glass jar. Pour enough olive oil over top so that the oil completely covers the feta. Screw the lid on the jar and place in the fridge for at least one hour or up to two weeks. Just crumble the feta onto whatever you wish. In a food processor, combine olives, parmesan cheese, parsley, garlic and pepperoncini and blend 1 minute. With motor running, slowly pour in olive oil until a thick, smooth paste is formed. Store in the fridge in a glass jar or bowl until ready to use. When you are just about ready to put your pitas together it is time to "fry" the zucchini. In a bowl, whisk together the egg and buttermilk. In another bowl, whisk together the Panko, flour, parmesan, salt and pepper. Heat a large skillet over medium heat and add olive oil. Dip each zucchini slice in the egg mixture to coat, then dredge through the breadcrumbs, pressing gently to adhere. Place in the skillet and cook until golden. This took me about 3 to 4 minutes per side. When finished, remove the slices and let drain on a paper towel. Place a medium skillet over medium heat on the stove. Add a drizzle of the oil from the marinated feta or sun-dried tomatoes. Add the chickpeas and toss well. Cook until the chickpeas are warmed through. Pre heat the grill to medium heat. 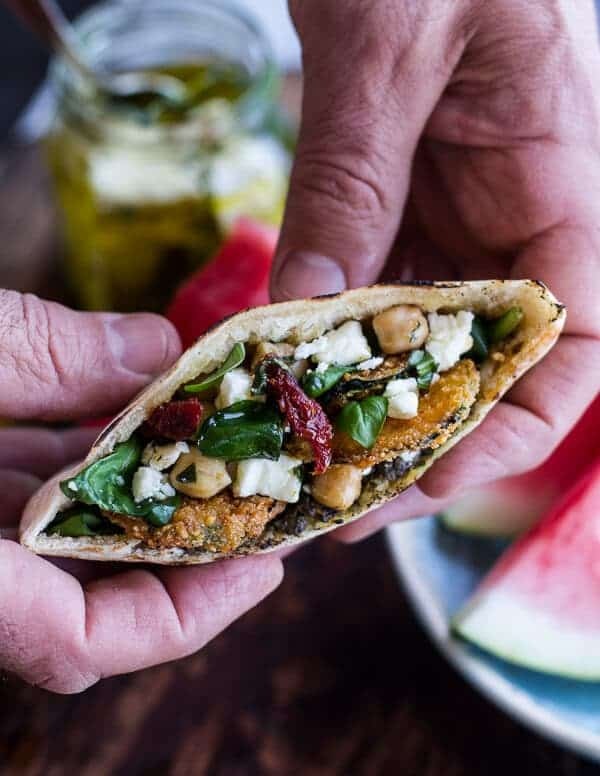 Break open your pita pockets and rub the inside of each pocket with a little of the greek olive pesto, Place a few zucchini slices on top of the pesto and then a handful of chickpeas. Add the sun-dried tomatoes and a little sprinkle of marinated feta. Carefully place the pockets on the grill and grill for 3-4 minutes per side or until the pockets are warm. 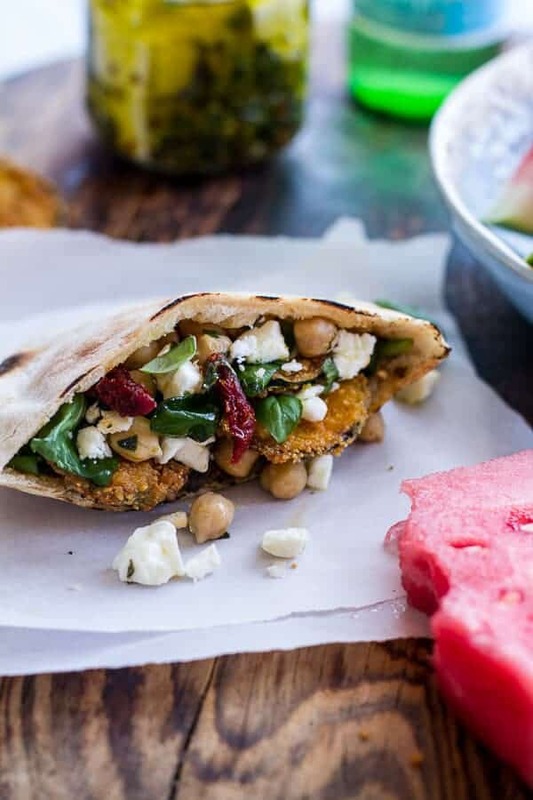 Remove from the grill and stuff each pocket with arugula and more marinated feta. Eat!! Well watermelon and fried zucchini! 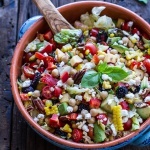 Easy Summer Herb and Chickpea Chopped Salad with Goat Cheese. I would love to have these for lunch (or breakfast, honestly!). They are packed with some of my favorite things and since we’re coming up on zucchini season, I know I’ll be making these! Wow, this is the ultimate sandwich, Tieghan! Holy flying monkeys batman! That is MY kind of pita. Zucchini is my life (my husband is begging me to make a new vegetable side dish) and with feta and garbanzos? My belly is happy. Pinned! why is it that food looks so beautiful in jars? Nice work these look delicious! Holy. It most certainly does look like you made the best sandwiches!! YUM! Oh fried zucchini, how I love thee! And yes, no dish is complete without watermelon during summer. Only 5 bucks at my local grocery store this week, yay!! 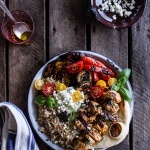 This looks amazing- I’ve got to try that marinated feta! Good luck with your trip! Olives, feta and sundried tomatoes…so good. 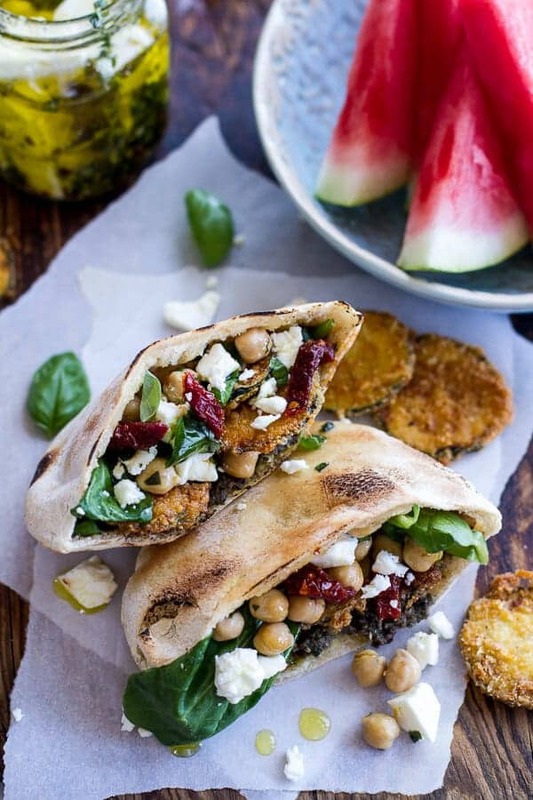 These pitas look so yummy…I would love to be eating this right now. 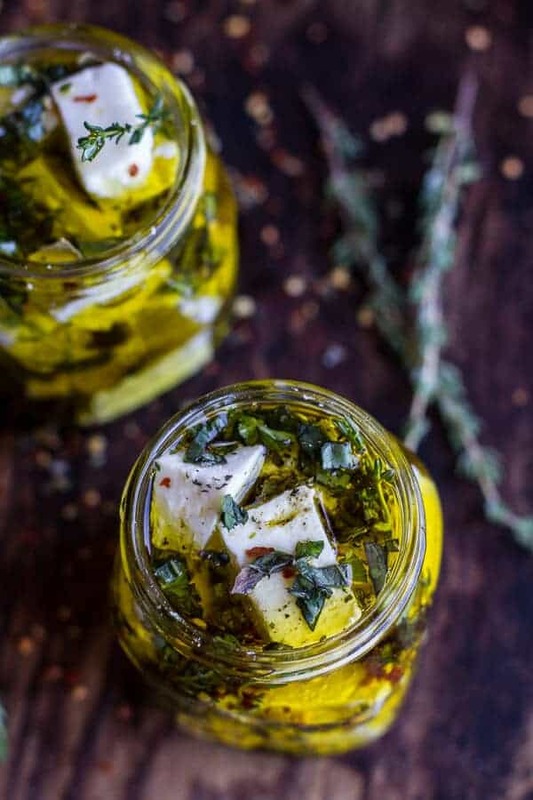 I’ve never marinated feta..it doesn’t stay in the house long enough, but I’ve got to try that. First off that gif of you pouring the olive oil is so cool! Second off this recipe sounds absolutely incredible. Fantastic job! This looks insane! Btw-When I’m nervous I fidget a lot too and I smile excessively. YUM! These look amazing! 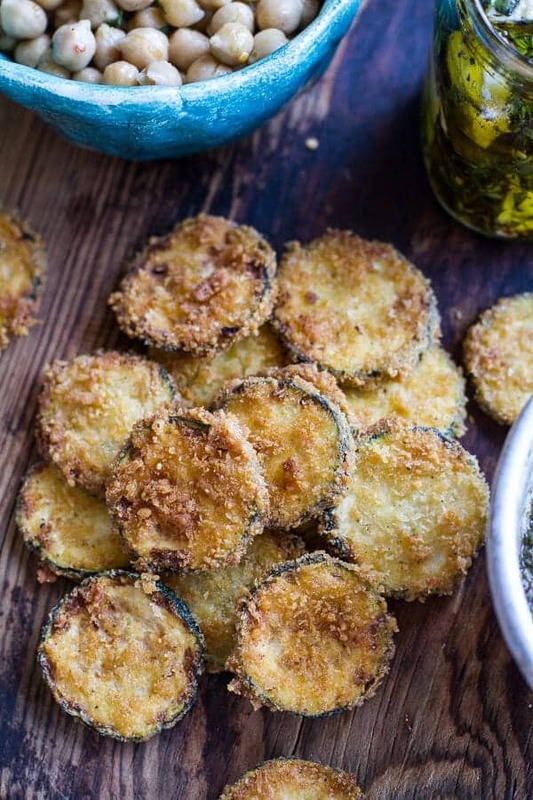 I am obsessed with all things fried zucchini–hope you have (had?) a great flight to FL! Omg, T! This is lunch perfection!!! I’ll be craving all day now. Awesome pitas, Tieghan. Zoom me one for lunch today?! Oh man these look so delicious! The idea of an olive pesto is just brilliant. I can’t WAIT to try these! Okay…as good as these are, I’m sure – I must talk about your photography! It blows me away. Beautiful job! Oh my goodness!! 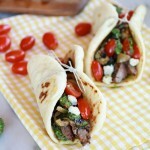 I love how stuffed these pitas are and the ingredients sound like the best lunch idea ever!! Gahhh I love Greek/Mediterranean cuisine!! LOVE the marinated feta! I could eat that straight! pinned. Oh man! I looooove Greek food and these look unbelievably incredible! I don’t think there is anything your could stuff in these to make me want them more. Whyyyy am I not eating one of these right this second?! You got me extremely hungry! I am SO in love with that GIF! This post looks so delicious Tieghan. 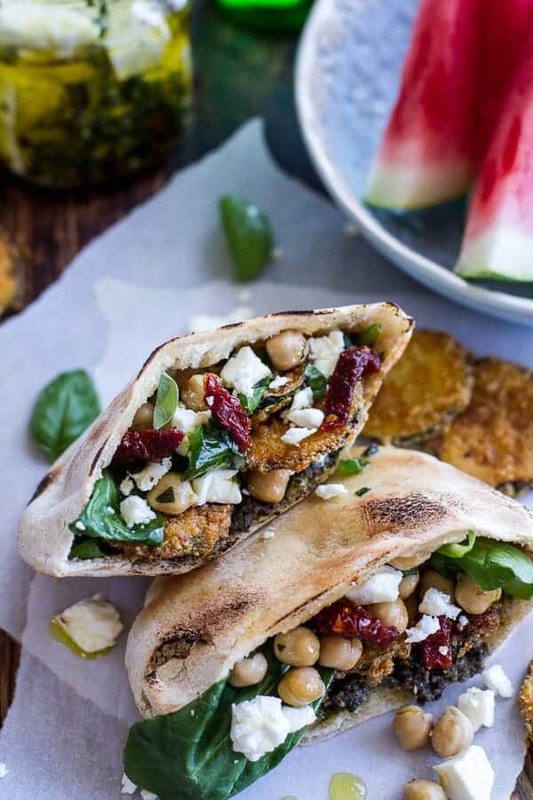 These pitas look incredible, love the sun-dried tomatoes and pesto! So many delicious components here that it can only be amazing. Hope to try this sometime! That feta! So beautiful. I could eat these sandwiches all afternoon–preferably on a nice hot day, with a giant pitcher of iced tea. Yay! Omg. Over the best two days, I keep coming back to your blog after finding delicious recipes on foodgawker. But this one has my name written all over it! Love everything about this!!! I love that each component of this is something delicious in of itself, I can’t even imagine what the whole sandwich tastes like! You mention using buttermilk for the fried zucchini; how much? Thanks! 1/4 cup! sorry about that. I could use this for lunch tomorrow. 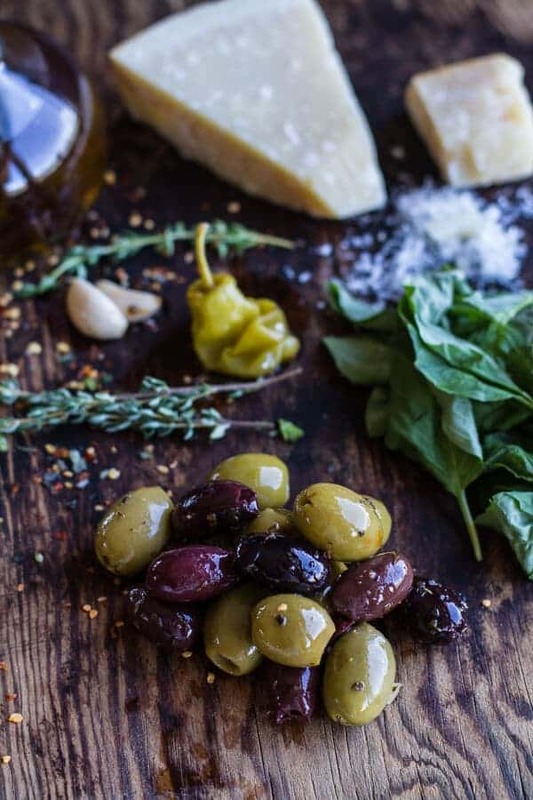 Love Greek olives! Oh man! I made these for dinner tonight and they were a hit with everyone, including a 15 month old and a 3 year old. I didn’t marinate the feta (to save on the calories in the oil) instead I bought Mediterranean herbed feta at the market and I seasoned the chick peas with some of the pesto for the same reason. DELICIOUS. I skipped the pita on my second helping and made a big salad over the arugula and I can’t decide which I like more. So happy they were a hit! Thank you! hi there! just wanted to ask how long will the marinated feta stay well for? love your website ! About 3 weeks to a month. Hope you love this! So happy you loved both recipes, thanks so much! These look amazing ! Definitely trying them for lunch this week. Tieghan you are an inspiration! I am having sooo much fun with your recipes! Your food (and the photos!) are incredible! Hi! I am so sorry, about 1/2 cup. Hope you love this! Think you have some typos. For ingredients you list basil for the olive pesto, but in the directions you say parsley. Then for the front Ed zucchini, you don’t list buttermilk, but the instructions do. Just slightly confused, but I did marinate the feta and make the olive pesto using basil last night. I’ll just wing it for the zucchini. A few things… In the recipe there is no call for buttermilk. For the pesto it lists parsley but in the directions it lists basil… And in the pictures, the greens don’t look like arugula. I made this and figured out some of the things but was a little confused. So sorry for the trouble. I will fix the recipe. Looks amazing…can’t wait to try withzicchini from my garden this summer 😊. Hey, I REALLY want to make this, but I see the recipe instructions calls for buttermilk, and there was no buttermilk listed in the ingredients? I assume it got mixed up with the eggs, because it says to use “1 cup large egg”… so I also don’t know how many eggs to use. I also don’t see parsley in the ingredients, but it was mentioned in the pesto instructions. Hoping you can clarify soon! What does this mean??? “1 cup large egg use 1/3 coconut milk for a vegan version” Is it one large egg and one cup or 1/3 cup? One cup large egg makes no sense. Also you have in this: marinated kalamata olives and green olives. What type of green olive? The kind with the pimento or without? There are many different types of green olives. Hi Sue, it’s 1 large egg or 1/3 cup coconut milk for a vegan version. I like to use green olives without pimento. Please let me know if you have any other questions. I hope you love this recipe! Thanks! The link to pita bread opened dad’s pasta dish! Thought you would want to fix it. I am going to use the search anyway! Oops sorry about that Sree! Thank you!